where an estimated 20,000 black schoolchildren participated in a protest demanding a better quality education and the right that their education be in their own language. 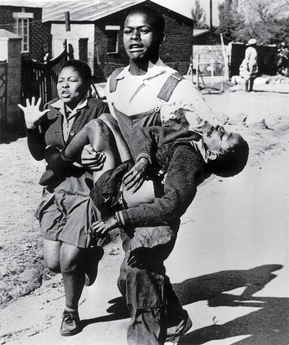 Since June 16, 1991, the International Day of the African Child honors about 176 protesters killed during this event and in South Africa, a pubic holiday continues to celebrate the memory of those courageous youth as Youth Day. In this ordinary day, June 16, may we continue to raise awareness in those and ourselves for the “continuing need for improvement of the education provided” not only to the African child but every child who lacks in the right to be properly educated. Has an ordinary day for you become more important because of a courageous historical event? Just a Simple Warning: Don’t Get Close to this Bored Cockatoo Bird! WOW–thanks for this one, Sunshine. God bless you Big! ‘Mornin’, Sunshine–I wanted to thank you for the tutorial re clearing browsers (let’s see how long I can keep that in my fuzzy little brain–oh, I could make notes!). I didn’t clear everything, but most of it; if necessary, I’ll go back and do all of it–I haven’t tried yet, to see if that fixed the “issue”. I’ve done the Forum bit several times now–and I’ll check today, to see if anyone has responded–do they NOT send you an email? I guess it’s up to me to check the Forum. The reason I don’t have an up-to-date browser is because it causes issues elsewhere, and my tech told me “newer is not always better”. As far as blog visiting/commenting–the one thing I can successfully do, is like today: I came here as though I was a stranger, then signed in to leave my comment–rather than already being signed in at CV, or through my email program. I’ll get it worked out–it’s just been a giant week-long headache. And I now know it’s not just moi–others are having the same issues–which tells me it’s WP, and not my browser or anything I’m doing or not doing. Right?? Whatever you did kept this comment out of the spam box so you must have fixed something. I think Forum you have to check back but they may have a box to check if you want an email alert. Your second to the last paragraph is confusing me but one thing I do notice is your blog site has appeared in my subscriber list at least twice now. That means, you must have not been following this blog and suddenly you are a follower again. I noticed it twice now. It’s the yo-yo effect…hehe. You may want to check http://onecoolsitebloggingtips.com/ every once in awhile. Time thief has lots of cool advice and she helps in the forum as well. Thanks for more tips! I’m “following” but not “email subscribed” to anyone I don’t think… Still working on finding a reliable way to keep with with my faves! See ya later (possibly in spam)! God bless you! No, this was not in spam–yay! “Google Reader”? That’s one more thing I’m not familiar with–if you have time and inclination, could you educate me on that? Is it part of the Google Plus circle of fans/friends thing? Great bargains are God’s extra blessings in life–gotta love His sense of style!! Now sis, Caddo, I told you to stop dropping into the spam box!! You must have a magnet on ya because it seems to be pulling ya in sis. There are various readers and Google reader is just one. You sign up with Google and set up the reader part. It’s not connected to the Google Plus but you can be part of it if you want to. Anyway, once you get your reader, you add all your favorite subscribers into the reader and it will walk you through setting up how you want to read your subscribers. In essence, it’s like a book you put together with all your subscribers in it. Once you have your subscribers in place, you just sit back and open which blog post you want to read or you can go ahead and open a certain blog site and it will drop down every post that blogger has posted. You then select what you want to read. Thanks, Sunshine–I’m gonna owe you a BIG bowl of banana pudding, or something. Will check out the Google reader next! No worries Caddo…just good to see you out from spam. 🙂 Have a great day! What an important celebration to remember. I saw the children in the Townships doing so many great activities that express who they are – with a flair for colour, music and raw joy! I know there is lots of hardship not available for foreign eyes. I know… May the children keep being heard. This is wonderful news, Souldipper, and I’m happy to hear about the activities, music and simply celebrating and yes, may these children and all children continue to fight for the opportunity to have their basic needs met. It’s sad to have to even say it. Wow, your blog looks amazing, Sunshine! I love the fount. I agree, everybody must get the opportunity to be educated very well. Thanks so much Angelswhisper and hehe, of course I love the Sunshine Award. Thanks and I’ll be over to check it out. 🙂 See ya! What a touching tribute this is! My prayers that many ears will listen and many hearts will be moved! God bless you and the children! Thank you Sunshine I didn’t know about this terrible tragedy, bless you.